"Anne de Bretagne" redirects here. For the rock opera, see Anne de Bretagne (rock opera). Anne of Brittany (French: Anne de Bretagne; Breton: Anna Breizh) (25/26 January 1477 – 9 January 1514) was Duchess of Brittany from 1488 until her death, and queen consort of France from 1491 to 1498 and from 1499 to her death. She is the only woman to have been queen consort of France twice. During the Italian Wars, Anne also became queen consort of Naples, from 1501 to 1504, and duchess consort of Milan, in 1499–1500 and from 1500 to 1512. Anne was raised in Nantes during a series of conflicts in which the king of France sought to assert his suzerainty over Brittany. Her father, Francis II, Duke of Brittany, was the last male of the House of Montfort. Upon his death in 1488, Anne became duchess regnant of Brittany, countess of Nantes, Montfort, and Richmond, and viscountess of Limoges. She was only 11 at that time, but she was already a coveted heiress because of Brittany's strategic position. The next year, she married Maximilian I of Austria by proxy, but Charles VIII of France saw this as a threat since his realm was located between Brittany and Austria. He started a military campaign which eventually forced the duchess to renounce her marriage. Anne eventually married Charles VIII in 1491. None of their children survived early childhood, and when the king died in 1498, the throne went to his cousin, Louis XII. Following an agreement made to secure the annexation of Brittany, Anne had to marry the new king. Louis XII was deeply in love with his wife and Anne had many opportunities to reassert the independence of her duchy. 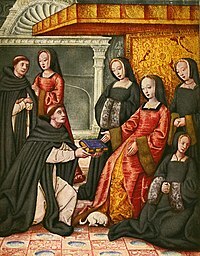 They had two daughters together and, although neither could succeed to the French throne due to the Salic Law, the eldest was proclaimed the heiress of Brittany. Anne managed to have her eldest daughter engaged to Charles of Austria, grandchild of Maximilian I, but after her death in 1514, her daughter married her cousin Francis I of France. This marriage later led to the formal union between France and Brittany. Anne is highly regarded in Brittany as a conscientious ruler who defended the duchy against France. In the Romantic period, she became a figure of Breton patriotism and she was honoured with many memorials and statues. Her artistic legacy is important in the Loire Valley, where she spent most of her life. She was notably responsible, with her husbands, for architectural projects in the châteaux of Blois and Amboise. Anne was born on 25 or 26 January 1477 in the Castle of the Dukes of Brittany in the city of Nantes in what is now the Loire-Atlantique département of France, as the eldest child of Duke Francis II of Brittany and his second wife Margaret of Foix, Infanta of Navarre. Four years later (before 10 May 1481), her parents had a second daughter, Isabelle. Her mother died when she was little, while her father died when Anne was eleven years old. It is likely that she learned to read and write in French, and perhaps a little Latin. Contrary to what is sometimes claimed, it was unlikely that she learned Greek or Hebrew and never spoke or understood the Breton language. She was raised by a governess, Françoise de Dinan, Lady of Chateaubriant and by marriage Countess of Laval. In addition, she had several tutors, including her butler and court poet, Jean Meschinot, who is thought to have taught her dancing, singing and music. In this period, the law of succession was unclear, but prior to the Breton War of Succession mainly operated according to semi-Salic Law; i.e., women could inherit, but only if the male line had died out. The Treaty of Guérande in 1365, however, stated that in the absence of a male heir from the House of Montfort, the heirs of Joanna of Penthièvre would succeed. By the time Anne was born, her father was the only male from the Breton House of Montfort, and the Blois-Penthièvre heir was a female, Nicole of Blois, who in 1480 sold her rights over Brittany to King Louis XI of France for the amount of 50,000 écus. The lack of a male heir gave rise to the threat of a dynastic crisis in the Duchy, or to its passing directly into the royal domain. To avoid this, Francis II had Anne officially recognised as his heiress by the Estates of Brittany on 10 February 1486; however, the question of her marriage remained a diplomatic issue. Anne was betrothed a number of times. In 1480 she was officially promised in marriage to Edward, Prince of Wales, son of Edward IV of England; however, soon after the death of Edward IV in 1483 the boy disappeared, presumed to have been killed - some say on the orders of his regent, Richard III. Maximilian, King of the Romans and Archduke of Austria, widower of Mary of Burgundy, daughter and heiress of Charles the Bold. Alain I of Albret, son of Catherine of Rohan and Jean I of Albret. Through his mother, he was a great-grandson of Duke John V of Brittany, and thus a possible heir. Although he was an ally of Duke Francis II, Anne refused to marry him because she found him repulsive. Louis, Duke of Orléans, cousin of King Charles VIII and in turn future King, was another aspirant for her hand, despite being already married to the King's sister Joan. John IV of Chalon-Arlay, Prince of Orange. A grandson of Richard, Count of Étampes, and nephew of Francis II, he was in line to the throne after Anne and Isabelle. Edward Stafford, 3rd Duke of Buckingham. In 1488 Henry VII had suggested a marriage between Buckingham and Anne, but in December 1489 the executors of Henry Percy, 4th Earl of Northumberland, paid the King £4000 for Buckingham's marriage to Percy's eldest daughter Eleanor. Viscount John II of Rohan, also in line to the Breton throne, offered with the support of Marshal Jean IV de Rieux a double marriage of his sons François and Jean with Anne and her sister Isabelle, but Francis II opposed this plan. In 1488, Francis II was defeated at the Battle of Saint-Aubin-du-Cormier, ending the Mad War (la Guerre Folle) between Brittany and France. In the Treaty of Sablé (19 August 1488), which concluded the peace settlement, the Duke was forced to accept clauses stipulating that his daughters were not to marry without the approval of the King of France. With the death of Francis II soon afterwards (9 September 1488) as a result of a fall from his horse, Brittany was plunged into a fresh crisis, leading to the final Franco-Breton war. On his deathbed, the Duke made his daughter promise never to consent to the subjugation of the Duchy to the Kingdom of France. Before he died, Francis II appointed the Marshal of Rieux guardian of his daughter. After fleeing Nantes following the division of her advisors over the issue of her marriage, Anne was crowned Duchess of Brittany in Rennes on 10 February 1489. At the age of thirteen, on 19 December 1490, she was married by proxy to Maximilian I of Austria at Rennes Cathedral. This conferred upon her the title Queen of the Romans. The French regarded it as a serious provocation—it not only violated the Treaty of Sablé (the King of France not having consented to the marriage), but also reintroduced an enemy of the French as ruler of Brittany, which they had wanted to avoid during the 14th and 15th centuries. The marriage also proved ill-timed: the Habsburgs were too busy in Hungary to pay any serious attention to Brittany, and the Castilians were busy fighting in Granada. Although both Castile and England sent small numbers of troops to supplement the Ducal army, neither wished for open warfare with France. The spring of 1491 brought new successes by the French general La Trémoille (the previous victor of the Battle of Saint-Aubin-du-Cormier), and King Charles VIII of France came to lay siege to Rennes, where Anne stayed, to force her to desist from her Habsburg marriage. After two months of siege without assistance and unable to resist any longer, Rennes fell. Charles VIII entered the city on 15 November, and both parties signed the Treaty of Rennes, ending the fourth military campaign of the French over Brittany. After refusing all proposed marriages with French princes, Anne became engaged to the King on 17 November 1491, in the vault of the Jacobins in Rennes. Then, escorted by her army (ostensibly to show that she had willingly consented to the marriage), Anne went to Langeais to be married. Austria made diplomatic protests (especially before the Holy See), claiming that the marriage was illegal because the bride was unwilling, that she was already legally married to Maximilian, and that Charles VIII was legally betrothed to Margaret of Austria, Maximilian's daughter. The official marriage between Anne and King Charles VIII of France was celebrated in the Great Hall of the Château de Langeais on 6 December 1491 at dawn. The ceremony was concluded discreetly and urgently because it was technically illegal until Pope Innocent VIII, in exchange for substantial concessions, validated the union on 15 February 1492, by granting the annulment of the marriage by proxy with Maximilian, and also giving a dispensation for the marriage with Charles VIII, needed because the King and Anne were related in the forbidden fourth degree of consanguinity. The marriage contract provided that the spouse who outlived the other would retain possession of Brittany; however, it also stipulated that if Charles VIII died without male heirs, Anne would marry his successor, thus ensuring the French kings a second chance to annex Brittany permanently. Court of the Ladies of Queen Anne of Brittany, Miniature representing this lady weeping on account of the absence of her husband during the Italian war, a 19th-century illustration based on a miniature from a 16th-century manuscript, "Epistres Envoyées au Roi". Queen Anne in prayer. Miniature from the Grandes Heures d'Anne de Bretagne (ca. 1503-1508). By the marriage of 1491, Anne of Brittany became Queen consort of France. Her marriage contract stated that it was concluded to ensure peace between the Duchy of Brittany and the Kingdom of France. She made Charles VIII her perpetual representative. On 8 February 1492, Anne was crowned Queen of France at St. Denis Basilica. She was the first Queen crowned there and consecrated, "anointed in the head and chest" by André d'Espinay, Archbishop of Bordeaux. Her husband forbade her to use the title of Duchess of Brittany, which became a bone of contention between the two. Gabriel Miron became the Chancellor of the Queen and her first doctor; he signed the marriage contract of the Queen with King Louis XII on 1 January 1499. Anne's marriage began badly: she brought two beds with her when she came to marry Charles, and the King and Queen often lived apart; despite this, she was pregnant for most of her married life (with a child every fourteen months on average). When her husband fought in the wars in Italy, the regency powers were exercised by his sister Anne of Beaujeu, who had held this position between 1483-1491. Anne of Brittany had a limited role in France and Brittany and sometimes had to accept being separated from her children in infancy. She lived primarily in the royal castles of Amboise, Loches and Plessis or in the towns of Lyon, Grenoble or Moulins (when the king was in Italy). At Amboise, when Charles VIII had work, she mainly resided in the nearby Clos Lucé, the future home of Leonardo da Vinci. She built her chapel. She became Queen Consort of Naples and Jerusalem during the conquest of Naples by Charles VIII. When Charles VIII, heir of the rights of the Kings of France over Brittany, died as the result of an accident on 4 April 1498, Anne was 21 years old and without surviving children. She then personally took charge of the administration of the Duchy of Brittany. She restored the faithful Philippe de Montauban to the chancellery of Brittany, named Jean de Châlon, Prince of Orange, as Hereditary Lieutenant General of Brittany, appointed her squire Gilles of Texue as responsible of the Château de Brest, convened the Estates of Brittany, and ordered production of a gold coin bearing her name. Around her, there was a famous circle of court poets, among them the Italian humanist Publio Fausto Andrelini from Forlì (who spread the New Learning in France), historian Jean Lemaire de Belges and poet Jean Marot. She also took into her service the most famous musicians of her time: Johannes Ockeghem, Antoine de Févin, Loyset Compère and Jean Mouton. Anne of Brittany was undoubtedly the first Queen of France to appear as a patron sought after by artists and writers of her time. Three days after her husband's death, the terms of her marriage contract came into force; however, the new King, Louis XII, was already married, to Joan, daughter of Louis XI and sister to Charles VIII. On 19 August 1498, at Étampes, Anne agreed to marry Louis XII if he obtained an annulment from Joan within a year. Days later, the process for the annulment of the marriage between Louis XII and Joan of France began. In the interim, Anne returned to Brittany in October 1498. If Anne was gambling that the annulment would be denied, she lost: Louis's first marriage was dissolved by Pope Alexander VI before the end of the year. Anne's third marriage contract, signed the day of her marriage (Nantes, 7 January 1499), was concluded under conditions radically different from those of the second. She was no longer a child, but a Dowager Queen, and determined to ensure the recognition of her rights as sovereign Duchess from that point forward. Although her new husband exercised the ruler's powers in Brittany, he formally recognized her right to the title "Duchess of Brittany" and issued decisions in her name. Also, she ensured that their second child, son or daughter, would inherit the duchy of Brittany, a clause that would not be respected later. Anne's second coronation ceremony as Louis XII's consort took place on 18 November 1504, again at St. Denis Basilica. Anne lived mainly at the Château de Blois, where the presence of the Duchess of Brittany was visible everywhere. She built the tomb of her parents at Nantes Cathedral (where her heart would also return under the terms of her last will) with the symbols of the four virtues: Courage, Temperance, Justice and Prudence, that she always tried to wear. All Italian arts were appreciated by the Queen. During an illness of Louis XII she made a tour of Brittany (not the Tro Breizh, contrary to what is often said). As Duchess, Anne fiercely defended the independence of her Duchy. She arranged the marriage of her daughter, Claude, heiress of the Duchy, to Charles of Austria, to reinforce the Franco-Spanish alliance and ensure French success in the Italian Wars. The marriage contract was signed on 10 August 1501 in Lyon by François de Busleyden, Archbishop of Besançon, William de Croÿ, Nicolas de Rutter and Pierre Lesseman, all ambassadors of Duke Philip of Burgundy, Charles' father. However, the engagement was cancelled by Louis XII when it became likely that Anne would not produce a male heir. Instead, Louis XII arranged a marriage between Claude and the heir to the French throne, Francis of Angoulême. Anne, determined to maintain Breton independence, refused until death to sanction the marriage, pushing instead for Claude to marry Charles, or for her other daughter, Renée, to inherit the Duchy. It is at this point that she took the opportunity to tour the Duchy, visiting many places she had never been able to see as a child. Officially it was a pilgrimage to the Breton shrines, but in reality it was a political journey and an act of independence that sought to assert her sovereignty over the Duchy. From June to September 1505, she made triumphal entries into the cities of the Duchy, where her vassals received her sumptuously. In addition, she ensured the proper collection of taxes. Exhausted by many pregnancies and miscarriages, Anne died of a kidney-stone attack in the Château de Blois at 6 a.m. on 9 January 1514, after having dictated in her will the customary partition of her body (dilaceratio corporis, "division of the body" in heart, entrails and bones) with multiple burials, a privilege of the Capetian dynasty, which allowed for multiple ceremonies (funerals of the body - the most important - and heart) and places (the burial of the body and heart). Anne's will also conferred the succession of Brittany upon her second daughter, Renée. Her husband ignored this, confirmed Claude as Duchess, and married her to Francis the year following Anne's death. When Francis became king in 1515, the Duchy of Brittany was once again the property of the queen consort of France. She was buried in the necropolis of Saint Denis. Her funeral was exceptionally long, lasting 40 days, and it inspired all future French royal funerals until the 18th century. On this occasion, the Herald of arms of Brittany Pierre Choqué pronounced for the first time the traditional lament: La reine est morte!, la reine est morte!, la reine est morte! (The Queen is dead!, The Queen is dead!, The Queen is dead!). Choqué also recorded that two Masses were read, the first by the Cordeliers (i.e., Franciscans) and the second by the Jacobins (i.e., Dominicans). Two requiems were also sung, possibly those that survive by Johannes Prioris and Antoine de Févin. Separate mourning motets by other members of the two royal choirs also survive: Quis dabit oculis by Costanzo Festa and Fiere attropos by Pierre Moulu. It was made by an anonymous goldsmith of the court of Blois, perhaps drawn by Jean Perréal. In 1792, by order of the National Convention, the reliquary was disinterred and emptied as part of the collection of precious metals belonging to churches. It was sent to Paris to be melted down, but was kept instead in the National Library. It was returned to Nantes in 1819 and kept in various museums; it has been in the Dobrée Museum since 1896. This relic was stolen April 13, 2018 from the Thomas-Dobree museum in Nantes, France. It was recovered undamaged later that month. 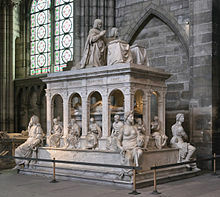 The double mausoleum Louis XII and Anne of Brittany, carved in Carrara marble, was installed at Saint Denis Basilica in 1830. The baldachin was in arcades, and in the base of the sarcophagus were depicted the victories of Louis XII (Battle of Agnadello, the triumphal entry into Milan), statues of the Twelve Apostles and the four Cardinal virtues, the work of the Juste brothers, Italian sculptors who received the order in 1515. The transi (whose realism was so shocking that it included an open abdomen stitched after the extraction of the entrails) and orans before a Prie-dieu crowning the platform are attributed to Guillaume Regnault. The tomb was desecrated during the Revolution on 18 October 1793 and the bodies were thrown into a mass grave. Alexandre Lenoir saved much of the monument, which was preserved in the Museum of French Monuments in 1795 before being returned to the Royal Basilica under the Second Bourbon Restoration. Anne as Queen, receives a book in praise of famous women, painted by Jean Perréal. Anne was a highly intelligent woman who spent much of her time on the administration of Brittany. She was described as shrewd, proud and haughty in manner. She made the safeguarding of Breton autonomy, and the preservation of the Duchy outside the French crown, her life's work, although that goal would prove failed shortly after her death. Anne was also a patron of the arts and enjoyed music. A prolific collector of tapestries, it is very likely that the unicorn tapestries now on view at The Cloisters museum in New York City were commissioned by her in celebration of her wedding to Louis XII. Of her four surviving illuminated manuscript books of hours the most famous is the Grandes Heures of Anne of Brittany. She also patronized printed books and their authors. She was a devoted mother, spending as much time as possible with her children. She commissioned a book of prayers for her son, Charles-Orland, to use in teaching him how to pray, and as guidance for his role as future King of France. Unfortunately, Charles-Orland died in 1495, and no other son lived more than a few weeks. According to the memoirs of Brantôme, Anne greatly expanded her household and retinue at court, especially in respect to young girls, forming a kind of finishing school, and in having a company of 100 Breton gentlemen at court. These innovations influenced later French courts. At her marriage to Charles VIII at age 14, Anne was described as a young and rosy-cheeked girl. By the time of her marriage to Louis, aged 22, after seven pregnancies with no surviving children, she was described as pale-faced and wan. By the end of her life, at 36, she had been pregnant 14 times, from which only two children survived to adulthood. Tomb of Charles Orland and Charles, two sons of Anne and Charles VIII at Tours Cathedral. Francis (August 1493). Anne had become pregnant in late 1492/early 1493, but travelled with her husband from castle to castle; she went into labour during a drive in the forest of Courcelles, and the child was premature and stillborn. Buried at Notre-Dame de Cléry. Stillborn daughter (March 1494). In her third pregnancy, Anne avoided travel (instead residing in Amboise near the Dauphin). However, in February 1494 she accompanied the king to Lyon, where he was preparing to depart for the Italian Wars. After arriving on 15 March, she attended all of the ceremonies; the stress of the occasion caused her to go into premature labour, and the child was stillborn. Stillborn daughter (March 1495). She had become pregnant again in late 1494, but lost the child soon after. Charles, Dauphin of France (8 September 1496 – 2 October 1496). :125 His death prompted Anne to withdraw temporarily to Moulins in despair. Buried at Tours Cathedral. Francis, Dauphin of France:125 (July 1497). He died several hours after his birth. Buried at Tours Cathedral. Anne of France:125 (20 March 1498). She died on the day of her birth at Château de Plessis-lez-Tours. Buried at Tours Cathedral. Renée of France (25 October 1510 – 12 June 1574), married Ercole II d'Este, the Duke of Ferrara, and became Duchess of Ferrara, of Chartres, and Lady of Montargis on occasion of her wedding. Each miscarriage or stillbirth is said to have delighted the ambitious Louise of Savoy, whose son Francis was the heir presumptive under the Salic Law. There even existed contemporary rumours that Louise used witchcraft to kill Anne's sons. Through her granddaughter Margaret, Duchess of Savoy (Claude's youngest daughter), Anne of Brittany was the ancestor of Vittorio Emanuele, Prince of Naples, the current pretender to the throne of Italy. Through her great-granddaughter Claude, Duchess of Lorraine (daughter of Henry II of France), Anne is also the ancestor of Karl von Habsburg, the current pretender to the throne of Austria. Through her granddaughter Anna d'Este (Renée's eldest daughter), Anne of Brittany is also the ancestor of the Houses of Guise and Savoy-Nemours. Château de Blois, gable of the chapel's entrance. There are shown crowned initials of Louis XII and Anne with their arms surrounded by the Orders of Saint Michael and the Cord. Coat of Arms of Anne of Brittany: the arms of her husband (Fleur-de-lis) to the left, and the arms of her father (Ermine tails) to the right. Anne had inherited from her predecessors the Breton dynastic emblems: a bandwidth Ermine (from John V), a simple Ermine (from John III) and a cord (from Francis II). As a widow of Charles VIII, and inspired by her father, she founded in 1498 the Order of the Ladies of the Cord. As a personal emblem, she also used the letter "A" crowned, with the motto Non mudera ("I will not change") and a particular form of the father's cord, knotted at 8. Her emblems were joined in the decoration of her castles and manuscripts with those of her husbands: the flaming sword of Charles VIII and the porcupine of Louis XII. She also used the motto Potius Mori Quam Foedari ("Rather die than dishonor") (in Breton "Kentoc'h mervel eget bezañ saotret"). wall covering of the burial in Solesmes Abbey, by Michel Colombe, 1496.
stained glass at Ervy-le-Châtel church, 1515.
stained glass at the town hall of Étampes, 1853. Statue of Anne of Brittany in the Reines de France et Femmes illustres series, Jardin du Luxembourg, Paris. Statue of Duchess Anne of Brittany, by Johann Dominik Mahlknecht. Cours Saint-Pierre, Nantes, France. Even while she was alive, the royal propaganda of Charles VIII and of Louis XII depicted Anne of Brittany as a perfect queen, a symbol of union and peace between the Kingdom of France and the Duchy of Brittany (the popular tradition of the "Good Duchess"). 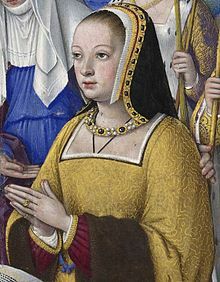 In the following centuries, historians and popular culture sometimes presented Anne of Brittany in differing fashions, ascribing to her physical and psychological characteristics that are not necessarily supported by historical evidence. After her death, she was gradually forgotten until the mid-19th century. After the foundation of the Breton Association in 1843, Breton regionalists sought a figure which could embody their ideal of agrarian and regional renewal, while expressing their attachment to the French nation. Their choice was Anne of Brittany (hence the legend of the "Duchess in clogs"). Many myths now surround Anne of Brittany, as a woman forced into an arranged marriage with Charles VIII, the Duchess of Brittany committed to the independence and happiness of her country, or otherwise of a Queen symbol of union and peace between Brittany and France. It has become an issue between those Breton historians pursuing a mythologizing of their past, and those forging a national historiography with the myth of a French nation one and indivisible. This symbolism explains the release of fifty books during the last 200 years giving contrasting visions of Anne: at one extreme there is Georges Minois, who presented her as a person "limited, petty and vindictive", and at the other Philippe Tourault, who gave her a "quite richly and favorable personality, ardently attached to her country and people". ^ Alain Bouchart, in his work Grandes Chroniques de Bretagne emphasizes 25 January as Anne's day of birth, other contemporary authors such as Jean de Penguern dit Dizarvoez in his Généalogie de très haulte, très puissante, très excellente et très chrétienne royne de France et duchesse de Bretagne (1510), proposed on 26 January for her birth day. Anne de Bretagne. Une histoire, un mythe, Somogy, 2007, p. 21. The 25 January 1477 corresponded to 15 January 1477 in the Old Style (where the year began at Easter). ^ a b c d e f Robin, Larsen & Levin 2007, p. 20. ^ Louis Dujardin: Quand naquit, quand mourut Anne de Bretagne? In: Bulletin de la Société Archéologique du Finistère vol. 88 (1962) pp. 301-309. ^ a b Jean Kerhervé: Anne de Bretagne in: franceinter.fr [retrieved 21 December 2014]. ^ Georges Minois: Anne de Bretagne, Fayard, 1999, p. 17. ^ Sophie Cassagnes-Brouquet: Un manuscrit d'Anne de Bretagne : Les vies des femmes célèbres d'Antoine Dufour, Ouest-France, septembre 2007 (251 pages), p. 19. ^ Henri Pigaillem: Anne de Bretagne. Épouse de Charles VIII et de Louis XII, Pygmalion, 2008, p. 18. ^ a b c Anne of Brittany in: theanneboleynfiles.com [retrieved 22 December 2014]. ^ Le Page, Dominique. "Pour en finir avec Anne de Bretagne". Archives départementales de Loire-Atlantique, 2004, p. 92. ^ Labande-Mailfert, Yvonne. Charles VIII et son milieu: 1470-1498 - La jeunesse au pouvoir, Librairie C. Klincksieck, 1975, p. 93. ^ Labande-Mailfert, Yvonne. Charles VIII. Le Page, Dominique; Nassiet, Michel. L'Union de la Bretagne à la France. Morlaix: Éditions Skol Vreizh, 2003. ^ On 27 October 1491, the Estates of Brittany, called by Charles VIII in Vannes, advised Anne to marry the King of France. ^ Le Page and Nassiet, p. 102. ^ Those present and showed are from left to right: <according to Madame Amèlie Delaunay of the Chateau Staff>: Princess-Regent & Duchess Anne de Beaujeu [aged 31 at the time of the marriage and also referred-to as "Madame La Grande" by her contemporaries], and her husband and co-Regent, the Sire De Beaujeu - Pierre II, Duc de Bourbon; then King Charles VIII [aged 21] and Duchess Anne [aged 14]. Behind the Royal Couple, Bishop Louis D'Amboise [in the white Mitre] and Charles, Cardinal D'Amboise, the King's Minister of State [think "Prime Minister"], wearing the cloth-of-gold mitre. The lady kneeling to arrange Duchess Anne's train is a likeness of her Chaperone-Teacher-Companion, Madame Françoise de Dinan, the Lady of Chateaubriant and Laval. Two Breton ladies-in-waiting are mentioned as being present by Bishop D'Amboise in his report to the Pope, but were unnamed. Around the table, recreating the final reading of the Marriage Contract before Charles VIII and Anne sign it, are: the Notary-Public of Tours, seated; Duke Louis of Orléans (the future Louis XII), standing; Chancellor Guillaume of Rochefort, seated; and the Prince of Orange, standing. All the likenesses are the best that could be achieved by the Forensic Reconstruction Sculptors commissioned by the Institut de France for the 500th Anniversary of the marriage, in 1991. ^ With the retroactive date of 5 December 1491. ^ This proxy marriage was thus considered as never having existed thanks to Canon Law that could invalidate the unconsummated marriage ceremony. ^ Minois, Georges. Nouvelle Histoire de la Bretagne, Fayard, 1992, p. 327. ^ Le Page and Nassiet, p. 105 ff. ^ The queens are commonly crowned in Reims Cathedral or in the Sainte-Chapelle. ^ Henri Pigaillem: Anne de Bretagne. Épouse de Charles VIII et de Louis XII, Pygmalion, 2008, p. 100. ^ Dominique Le Page, Michel Nassiet: L'Union de la Bretagne à la France. Morlaix : Éditions Skol Vreizh, 2003, p. 108 ff. ^ Chomel (Jean-Baptiste-Louis) Essai Historique sur la Médecine en France, (1762), p. 20. ^ Wickersheimer [Ernest, Jacquart (Danielle) Biographical Dictionary of doctors in France in the Middle Ages (1979), vol. 1] pp. 161-162. ^ On the obverse are shown the words translated from the Latin "Anne Queen of the Frenchs by the grace of God and Duchess of the Bretons" and on the reverse the motto of the ancient royal coins "May God's name be blessed". ^ Philippe Tourault: Anne, reine de France et duchesse de Bretagne, Paris, 1990, 1996, 2004, 2006, p. 196. ^ Michael Jones: Creation of Brittany, Continuum International Publishing Group, 1988, p. 391. ^ Christelle Cazaux: La musique à la cour de François Ier, Librairie Droz, 2002, pp. 39-40. ^ Sophie Cassagnes-Brouquet: Un manuscrit d'Anne de Bretagne, Ouest-France, 2007, p. 12. ^ Didier Le Fur: Louis XII: un autre César ?, Paris : Perrin, 2001. p. 38. ^ Started on 26 September. Didier Le Fur: Louis XII: un autre César ?, Paris : Perrin, 2001. p. 48. ^ Henri Pigaillem: Anne de Bretagne: épouse de Charles VIII et de Louis XII, Paris, Pygmalion, 2008, p. 98. ^ Cynthia Jane Brown: The Cultural and Political Legacy of Anne de Bretagne: Negotiating Convention in Books and Documents, p. 185 [retrieved 22 December 2014]. ^ Henri Pigaillem: Anne de Bretagne: épouse de Charles VIII et de Louis XII, Paris, Pygmalion, 2008, p. 257. ^ Alexandre Bande: Le cœur du roi. Les Capétiens et les sépultures multiples, XIIIe-XVe siècles, Tallandier, 2009, p. 250. ^ Didier Le Fur: Anne de Bretagne, Guénégaud, 2000, p. 135. ^ For a historical and musicological perspective on Prioris's Requiem, read Schreurs, Eugeen; Snellings, Dirk (2007). "Requiem voor Anna van Bretagne, koningin van Frankrijk". La polyphonie Française. Festival van Vlaanderen 2007. pp. 185–187. Recording: Johannes Prioris, Missa pro Defunctis, Capilla Flamenca, 2003 (Eufoda 1349). ^ Denis Raisin Dadre essay to recording of Antoine de Févin Requiem d'Anne de Bretagne. ^ Meaning: "In this little vessel of fine gold, pure and clean, rests a heart greater than any lady in the world ever had. Anne was her name, twice queen in France, Duchess of the Bretons, royal and sovereign." ^ "Stolen heart of French queen consort Anne of Brittany found". BBC News. 23 April 2018. Retrieved 23 April 2018. ^ François-Olivier Rousseau, Patricia Canino: Corps de pierre: gisants de la Basilique de Saint-Denis, Regard, 1999, p. 21. ^ Pierre Cabanne: Guide artistique de la France, Librairie Hachette, 1968, p. 180. ^ Alain Erlande-Brandenburg, Jean-Michel Leniaud, Xavier Dectot: Etudes d'histoire de l'art, Librairie Droz, 2001, p. 132. ^ De La Warr, Constance, A Twice Crowned Queen: Anne of Brittany, p.41. ^ "Tapestry in the Renaissance: Art and Magnificence". The Metropolitan Museum of Art. Archived from the original on 10 February 2008. Retrieved 9 January 2008. ^ a b c d e f g h i j k l m n o p q r s t u v Anselme de Sainte-Marie, Père (1726). Histoire généalogique et chronologique de la maison royale de France [Genealogical and chronological history of the royal house of France] (in French). 1 (3rd ed.). Paris: La compagnie des libraires. ^ N de Valois 1495 in: roglo.eu [retrieved 19 December 2014]. ^ Franck Ferrand: François Ier, roi de chimères, Éditions Flammarion, 2014. ^ Dominique Le Page: Pour en finir avec Anne de Bretagne ?, Archives départementales de Loire-Atlantique, 2004, p. 47. ^ Didier Le Fur: Anne de Bretagne, Guénégaud, 2000, p. 188. ^ Didier Le Fur: Anne de Bretagne, Guénégaud, 2000, p. 187 ff. ^ Collectif: Anne de Bretagne. Une histoire, un mythe, Somogy, 2007, p. 124. ^ Bernard Le Nail: On n'en finira donc jamais avec Anne de Bretagne ?? in: Agence Bretagne Presse [retrieved 24 December 2014]. ^ a b c d Courteault, Henri (1895). Gaston IV, comte de Foix, vicomte souverain de Béarn, prince de Navarre, 1423–1472 [Gaston IV, count of Foix, sovereign viscount of Béarn, prince of Navarre] (in French). É. Privat. Retrieved 8 August 2018. ^ a b c d Anthony, R. (1931). Identification et Étude des Ossements des Rois de Navarre inhumés dans la Cathédrale de Lescar [Identification and Study of the Bones of the Kings of Navarre buried in the Cathedral of Lescar] (PDF). Archives du Muséum, 6e series (in French). VII. Masson et Cie. pp. 9, 34. ^ a b Galand, Gérard (2005). Les seigneurs de Châteauneuf-sur-Sarthe en Anjou (in French). Cheminements. p. 289. Robin, Diana Maury; Larsen, Anne R.; Levin, Carole (2007). Encyclopedia of Women in the Renaissance: Italy, France, and England. ABC-CLIO. ISBN 978-1851097722. Wikimedia Commons has media related to Anne de Bretagne.